*Nullified models appear as FFFF FFFF 0000 0000 in header, do not appear anywhere or alter anything in Name Entries. Last edited by StarkNebula on Sun Aug 03, 2014 4:28 pm, edited 7 times in total. There's so much in so little space, I ran out of colours and had to make multiple copies highlighting different sections. *GCMF is likely either "GameCube Model File" or "GameCube Model Flag." Note: Volatile/Non-volatile indicates whether the values are flexible or not. If it is volatile, it will crash/hang the console. Purple: GCMF is the model flag. Pink: Unknown1: Not sure, but it's only present on test models and vehicle models (which are a little odd.) Non-volitile. Red: The model's offset from the origin point in floats. Blue: Object radius in floats. Yellow: Start of texturing library. Green: Vertex offset. From there on, vertices are described in 5 lines, proceeded by all it's segments simultaneously. (WRITING MORE INFO LATER). - Wrap flags, modelling, ANISO stuff and more in the Google Spreadsheet linked at the bottom. a. 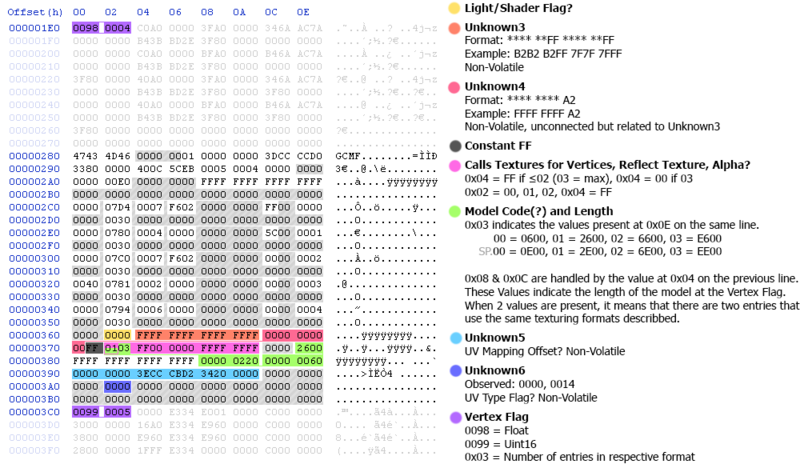 A value of 40 appears to be the flag to use to denote a reflective texture. b. A value of 02 appears to support 0214, 2014, and 2214 values in the 2 bytes after it. If it's not 02, all textures in model will have no mipmaps and will be all B/W. * I still need to look into alpha channel stuff here. Styling Flag? Orange: Calls the texture within the TPL. The line in the TPL = the number flag for the texture. Purple: Texture Number, used in the debug menu. The same texture can appear multiple times due to other factors such as ANISO type, styling type, reuse of other parts of the model, etc. Red: Unknown2: The values are semi arbitrary with little to work with. Look for 0xC0 in this Google Spreadsheet. It's just WTF. Dark Grey: A constant value of 0030 present after a texture entry. Yellow: This changes the lighting effect 'within the debug menu.' Not sure if it does anything else. Notes. Orange: It's very linear and predictable, but has a few variations. Doesn't do anything if you mess with it. Red: Same as the orange one. Sometimes present, sometime not. I've only seen 0000 0000 00, FFFF FFFF A2, and FFFF FFFF 11 here. Dark Grey: Constant of FF. Pink: Denotes the texture(s) used on that section of the model. Blue: Not sure. Perhaps related to UV mapping? Most of what I have is in this Google Spreadsheet. Last edited by StarkNebula on Thu Aug 07, 2014 2:42 am, edited 4 times in total. Have you ever had a look at super monkey balls 2's GMA files? Maybe it could help you to get more information. When will the breakdown thread about the collision files, gx-.lz files and ax-.lz files follow? Well, TPLs are done, so I can make that one any time. GMAs, while almost all done, could use a little updating. COLI files are hard. I've found some things, but my PC (hrm-iMac) isn't powerful enough to emulate GX at a sufficient pace to test out anything in a reasonable amount of time. So as for the COLI files, it's once I get myself a new PC. Super Monkey Ball GMAs are identical in format to GX's, so there's nothing to work there. As for the LZ files, I don't know squat about it so I won't be working there for quite a while. i can try out new things easily, because i can emulate gx at full speed most of the time (my old gtx 260 gfx-card causes some performance issues sometimes). we could try finding out information about the collision-files by comparing the 4 Sonic Oval files. The Story mode and GP Mode versions of Sonic oval come with dash plates and energy pits. the other ones come without them. and one has no road- and trackwall texturing. I've found out more things about the .gma files. the padding between the ANISO flag and Unknown 2 will be filled with addresses that tell the game were to load the texture from. (this can be used to swap textures with geckocodes. to do: checking out if others' tpl's textures can be loaded. EDIT: it works). the last 2 bytes of the texturing information show up the number of textures featuring alpha channel. by decreasing this value alpha textures will disappear. how ever, you can remove those textures with the previouse 2 bytes as well. but the last 2 bytes are exclusive for all alpha textures only. unknown1 knows more values besides 0x00 and 0x01. the pilot objects with 100 polygons use the value 0x05 there. by changing it the object can become invisible. but i don't think it's supposed to have anything to do with the object's visibility. it looks like that unknown2 defines the texture mapping. but i'm not sure! anyways, changing this value causes some messed up texture mapping (or freezes the game). I can help with the LZ files, I have the collision triangle format figured out. I also have programs to compress/decompress them, if you're interested. If that's the case, please post a detailed analysis of the collision format. If you are unsure of anything, specify that. Last I saw, you still had bugs with your collision. I also assume by something to decompress it, you mean a modified gxpand or LZSS decompressor that can decompress Super Monkey Ball files. I'd like to have a link on the forums here, it'd be handy. Perhaps it'd work with F-Zero AX. 0x4 Size of this header minus 0x0C? 2 byte triangle indicator, 0xFFFF terminated lists. The 8 bytes after the "debug menu lighting" value seem to be RGBA values, perhaps used as constants in the TEV unit? One last thing, the constant of 0x30 after texture entries does not occur in Super Monkey Ball GMA files for some reason.